Sony Ericsson can sit back and call it a job done. The last of the new Xperias is on the shelves and the impressive lineup gives them plenty of reasons to look forward to the holiday season. Quite a squad they have put together. The Sony Ericsson Xperia pro had to wait long months to finally get some game time. Announced way back in February, the Xperia messenger watched from the sidelines as others went ahead of it. It was a long line too, with two Arcs, two Neos, two minis, the PLAY, the Active and the Ray. It must've been a long wait for users too, judging by your comments on this website. There has been nothing official in the way of an explanation about the delayed launch. Maybe that's the way Sony Ericsson had planned it from the beginning. Perhaps they thought business users, who are a potential target, were least likely to lose their patience. Maybe they didn't want two very similar phones stepping on each other's toes - trying to get the best mileage out of the Neo before the Pro hit the shelves. Or maybe, they just wanted to finish with a bang. 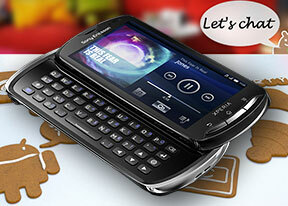 The Pro adds a physical QWERTY keyboard to the best Sony Ericsson have to offer today. That includes a LED-backlit Reality display with Sony Mobile BRAVIA Engine, an 8 megapixel ExmorR camera sensor, 720p video with continuous autofocus, and the latest Android 2.3.4. This phone can't be blamed for falling short of the mark. And we don't mean that it gets away with the lack of some premium features just because it was announced early this year. The way we see it, a multiple core processor is something for flagships to worry about. You can hold it against the Xperia Arc S. By the same token, a cameraphone like the Xperia Neo isn't quite up to scratch without the 1080p video recording. The Xperia pro for its part is a smart messenger that might appeal to both business customers and young social users. That's right, these are two completely different targets but it's just the way of a market steadily moving towards smartphones and all-inclusive user experience. Anyway, the point is enough people may actually find the Xperia pro relevant to what they need even without multiple-core processing or FullHD video. One thing we're sure they don't need is a huge gadget in their pocket. Sony Ericsson took their time with the Pro but it seems the competition hasn't been too keen on messengers either. There hasn't been anything major since the HTC Desire Z and the Milestone 2, at least not in Europe. The closest thing is another Sony Ericsson phone: the Xperia mini pro. We liked the mini messenger but Sony Ericsson obviously think it's time for the real deal. We're about to start our traditional hardware checkup and we're looking forward to a comfortable ride. The bigger screen and keyboard should make enough of a difference.